Windows 8 changed how we did a lot of things. Most notably, the way we recover and repair Windows has changed forever. Old tools we’d come to rely on were reworked or eliminated completely. New tools were added that seemed more cumbersome than before. 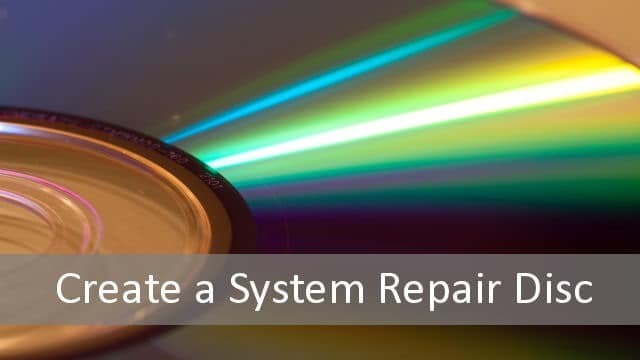 We’ll show you how to create a system repair disc like Windows 7 in Windows 8, so that if you ever needed to simply repair some issues with Windows, you can. These steps will only work in Windows 8. In Windows 8.1, the repair disc option has been disabled for the time being and a Windows 8 repair disc won’t work for a Windows 8.1 OS, no matter the version. Also, for the first time in Windows history, you’re only able to create a system repair disc tied to the version of Windows you’re using. That means if you’re using a 32-bit version of Windows 8, you can only use a 32-bit system repair disc on it. Same holds true for the 64-bit version, so make sure you create a system repair disc for each computer if these specs vary. Make sure you have a blank DVD installed. You can use CDs, but you might be using quite a few of them where a DVD will do a better job in a single disc. Select your CD/DVD drive from the menu options. It’ll only take a couple of minutes for the repair disc creation tool to finish working. Once done, you’ll have access to all the features that come with a Windows 8 repair disc. Creating a system repair disc for Windows 8 is a great way to get some of the old school options to fix your PC when it won’t boot. Microsoft added a lot of repair and recovery features but they took out some good ones, too. This allows you to create a repair disc and use it so long as you’ve utilized the right version of it. You’ll be able to fix a variety of boot-related issues with your Windows 8 repair disc. For the most part, this’ll give you a bootable system to work with. In some cases, it may not be enough and you may have to resort to a clean install or complete restore. Windows 8 gives you a lot of options to choose from when repairing, restoring and refreshing the OS when necessary. It’s important to learn what each of these tools does and how they can help you so you can be prepared to fix any issues that arise with Windows 8 or Windows 8.1 when they happen. Without these tools, you might be lost when an issue hits. Many of the tools Microsoft added to Windows 8 to recover and repair the OS have made a lot of sense. However, the removal of some of the tools and hiding other tools, like creating a system repair disc, have only made it harder of users who need to fix issues on their own with Windows 8. For now, you can create your system repair disc by following the above guide.